Thai Ridgebacks have been in existence in Thailand for more than 400 years and maybe even as long as 1,000 years, as early cave paintings portraying dogs with ridges have been found in Cambodia and Thailand. These sighthounds were used to hunt deer, tapir, and birds. Thai Ridgeback dogs stand 21 to 24.5 inches tall and weigh 37 to 60 pounds. The head and muzzle are wedge-shaped, the eyes are almond-shaped and dark brown, and the ears are upright. The body is longer than the dog is tall. The coat is short and may be black, red, blue, or fawn. The ridge on the back consists of hairs growing in the opposite direction of the coat and may be found in eight different patterns. The ridge begins at the shoulders and runs down the back to the point of the hips. The coat is easy to care for and needs only weekly brushing. The Thai Ridgeback is a moderately active dog. He will appreciate a couple of walks each day and a chance to run. Exercise should be on leash or inside a fenced yard. Like most sighthounds, if a small animal is flushed while he’s running, a Ridgeback will take off after it. These dogs are natural watchdogs and protective of their homes and families. Early socialization to a variety of people is important to make sure the dogs are not shy, fearful, or overly aggressive. 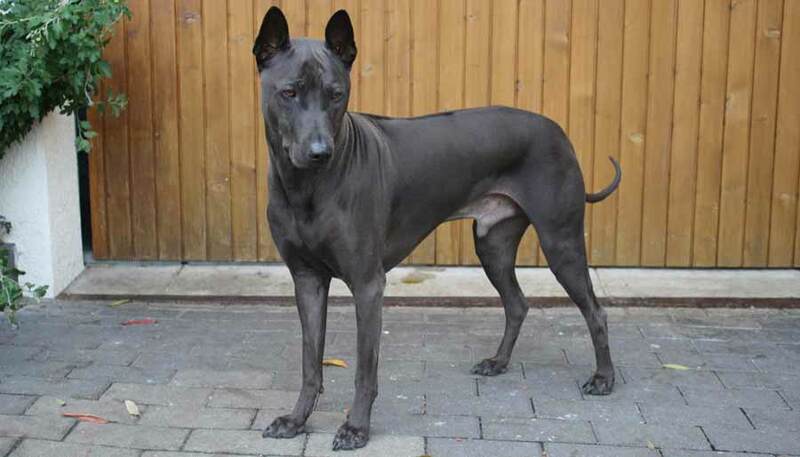 Thai Ridgeback breed can be dog-aggressive and so requires lots of socialization with other dogs from an early age. Thai Ridgebacks do well with training that is positive and fast paced; they bore easily and repetitive training is not for them. This breed is not for everyone and is best for an experienced dog owner. Thai Ridgebacks can be good with children when raised with them, but dogs not accustomed to kids may be aloof. The breed has a strong prey drive and loves to chase, so interactions with cats and other small animals should be carefully supervised. The primary health concern is problems with the dermoid sinus. Share your Thai Ridgeback story. Note: Upload only Thai Ridgeback picture or your picture with Thai Ridgeback below - spammer's ip may be blocked.